NEW VENICE NEWS: TURBINE SLED NEW TREND IN TRANSPORTATION ? 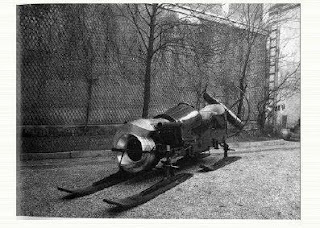 The Coanda Sled: New Trand in Transportation or... hot air? 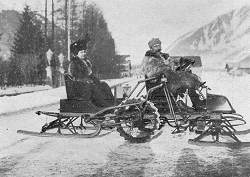 Unrivaled sensations of this year's Council of Custom and Commerce Machines & Motors Market in Machinery Hall, the new turbine-powered sleds by Coanda seem bound to become all the rage in ground transportation. 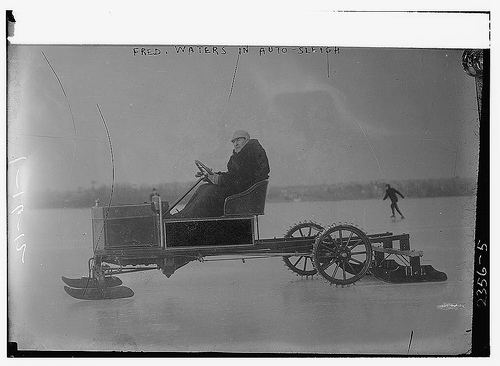 If it is doubtful that they are going to replace the propelled sled used by Subtle Army and the Jitneys Taxsleighs of the city, they could well supersede the Champagne Sleds on the Kingnes Speed Ring Rink and, beyond that, could well make their mark as a personal leisure vehicle outside the City Limits for all amateurs of speed. Their downside is that they tend to warm your backside a bit: even a bit too much, some say. The Champagne Sled: losing its fizz ? 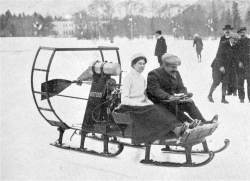 As every year, other vehicles have tried to contest the rule of the Bollee Sled as a family vehicle, but they have failed to impress the onlookers the way the Coanda did. 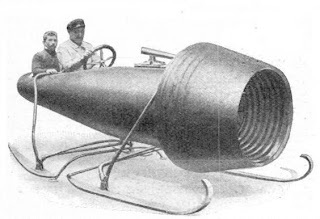 The Debesse Sled: put on ice ?